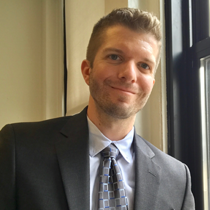 Travis joined NCLEJ as a Staff Attorney in May 2017 following seven years of service as a Trial Attorney at the Civil Rights Division of the United States Department of Justice. At DOJ, his work focused on enforcing the Americans with Disabilities Act and its prohibition of unnecessary segregation of individuals with disabilities. Travis’s work bolstered efforts to increase the availability of community-based Medicaid services nationwide, and has resulted in expanded access to services for tens of thousands of individuals with disabilities. He was significantly involved in building a number of DOJ’s enforcement actions that have resulted in systemic remedies, including a 2012 settlement that expanded North Carolina’s community-based supported housing program for individuals with serious mental illness. He has represented the United States as lead counsel in litigation brought by the federal government, and he has represented the United States as amicus curiae in a number of lawsuits brought by non-governmental advocacy organizations seeking to protect access to Medicaid. In addition to his work enforcing the ADA, Travis was a member of the Civil Rights Division’s Lesbian, Gay, Bisexual, Transgender and Intersex Working Group, where he supported the federal government’s efforts to combat discrimination affecting LGBTI communities. Travis graduated with honors from Washington University in St. Louis School of Law in 2009, where he served as an Editor of the Washington University Law Review. He was awarded degrees in Political Science and Economics from Saint Louis University in 2006.